With Valentine's Day just around the corner, I thought I would express my affection for my dear fans and friends by hosting another Giveaway! And as I just received my initial product samples from Bethany Lowe Designs, I have the perfect set to share! 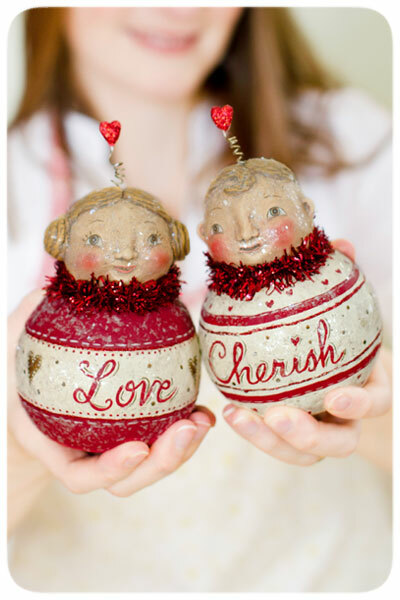 I am offering my sweet pair of ball-character cherubs that are debuting this year. 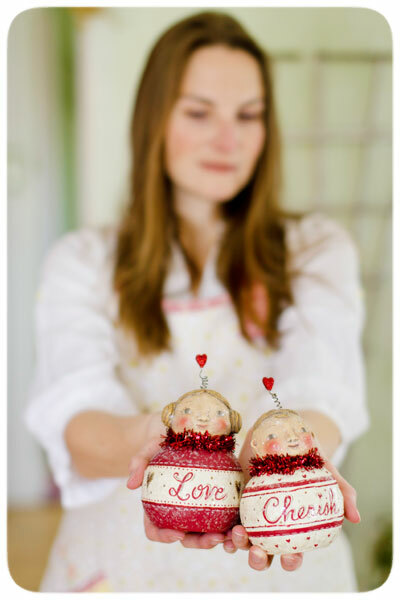 One says "Love" and the other, "Cherish," and they will arrive signed by me, the designer of this heart-warming duo! To enter to win this signed collector's set, simply leave a heartfelt comment below! Of course, if you'd like to increase your odds, keep reading for additional ways to be entered. I will be drawing the winner on the evening of January 28th, so you have plenty of time to play along and spread the word. Best of LUCK to you! 1.) Leave a heart-warming comment for me here at the bottom of this post by clicking on the "Comment" button ( and no worries, you do not have to create a Blogger account in order to leave a comment - you can simply click the "Anonymous" option when leaving your message. But, just make sure that I can somehow identify you if you are chosen! ) IF you are unable to leave a comment here, you can email me, and I'll add your comment for you. 3.) If you have your own Blog and choose to spread the word about my Giveaway on Your Blog, then I both thank you and welcome you to leave a 2nd comment here for a double entry! 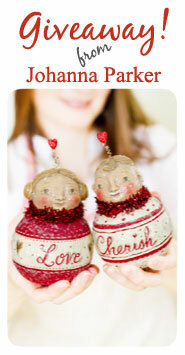 You can use the following Blog Badge to advertise on your blog's sidebar, or just grab the first, larger image above! Please remember to link back to me! 5.) Follow me on Twitter & share a TWEET about this fun Giveaway! If you do so, you are welcome to boast about it here in an additional comment for yet another entry at winning. 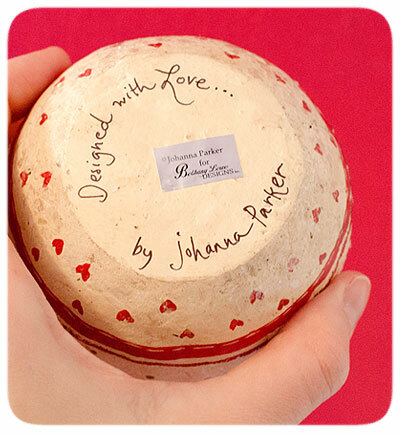 You can visit jparkerdesign ~ my Twitter link! OK!... So, as I said, there are LOTS of ways to enter!..... I look forward to reading your comments and hearing from you :) I will be posting the winner of this collectible SIGNED set of chubby cherubs in one week!.... Stay tuned and spread the word, and a big thanks to all of my loyal collectors and artist friends who have supported me through the years. Cheers to you!! Will you be the lucky winner?..... Thank you for entering!